The USD/JPY triggered alarms once again when it hit 75.95 on Friday. The start of trading on Monday saw Japanese Finance Minister with more tough messages. Minister Yoshihiki Noda said, “I’m worried that recent one-sided yen moves have been strengthening further.” The United States recently lost its AAA debt rating from the S&P credit rating agency. Last week, investors faced more negative U.S. data such as high inflation, high unemployment claims and low home sales. The moves of the USD/JPY pair are not only dependent on exports and imports between the two countries, but also speculators who use the Yen as a safe haven. 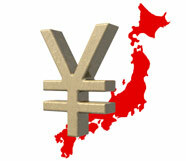 Japan’s recovery after the March 11 tsunami and nuclear crisis depends on the Yen. We analyzed various scenarios in the USD/JPY for our traders. This is the most likely scenario. The U.S. economy is feeling severe pains of recession and it is not likely to turn around soon. Because of this the U.S. Dollar is going to slide further and the Japanese Yen is going to continue to attract safe haven flows. The Japanese are running out of patience. We saw this scenario as recently as Aug 4, when the Japanese intervened single handedly. The USD/JPY moved up 250 pips in a couple of hours before giving it all back in three days. The size of the move of course will depend on the amount of Yen sold by the Japanese. In the recent move, the Japanese sold 4.5 trillion Yen in the interbank market. 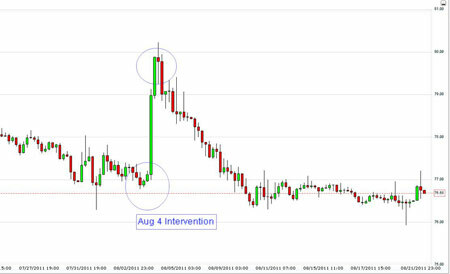 We expect the USD/JPY to touch 79.00 if interbank dealers report another intervention of similar size by the Japanese. This scenario creates a good opportunity for short term traders who are looking to enter and exit within a couple of hours of the move. This scenario has happened in the past but not a high probability. Recently Finance Minister Noda has said that Japan is in close contact with G7 Central Banks. Federal Reserve Chairman Ben Bernanke has enough problems in his hands with the state of the U.S. economy and we don’t expect the Fed to be in a sympathetic mood like they were after the March 11 earthquake. After the deadly tsunami, risk aversion drove the USD/JPY to 76.00 before a co-coordinated intervention by the G7 pushed up the pair almost 500 pips immediately and further 300 pips in the subsequent two weeks. While the joint show of force by the central bankers was impressive and the move by the USD/JPY even more impressive, the effect came undone in a month’s time and the USD/JPY was back to pre-earthquake levels of 80.00. If there is joint intervention in the markets, we expect the USD/JPY to touch 84.00. This creates good opportunity for traders who are looking for bigger moves over several days and a well defined exit strategy.